How is it possible that a tribal belly dancer in Eugene, Oregon can join in a performance with a dancer up in Portland and down in San Fransisco and dance so well together that it looks choreographed? There are secrets in the belly dance community that someone from outside the belly dance world might not know. Some of those secrets aren’t really that secret once involved in the world of belly dance and the biggest method of secret commuincation between performers include the non-verbal language of belly dance. There are many forms of dance that use choreography including belly dance. There are also styles of dance that use freestyle or improvisational dance. 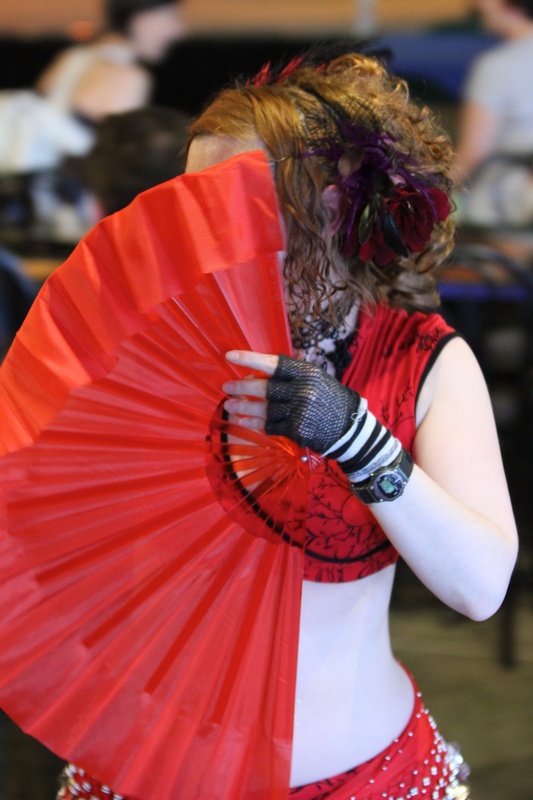 In tribal and tribal fusion belly dance troupes, there might be some use of choreography but much of it is improv. That means the same performers can dance to the same song multiple times and it will always be different. However, in order for this to be possible, we have to start with the same foundation of moves, and know what cues are used as cues. People who see a tribal or tribal fusion belly dance may wonder how dancers can dance in such harmony and synchronicity that it looks choreographed when it isn’t. The key is that dancers all know the same dance style. If all dancers are trained in ATS (American Tribal Style) belly dance or are familiar with a particular studio like Gypsy Caravan in Portland versus Sabine’s Celebration Studio in Eugene, Oregon, they will all know the same moves. If dancers know the same moves and combinations, know the cues that it is time to switch moves and are listening for musical changes, they will be able to follow along and join in with other dancers without too much difficulty. The more familiar a troupe is with eachother and have in common with each other the more smooth their transitions will look.